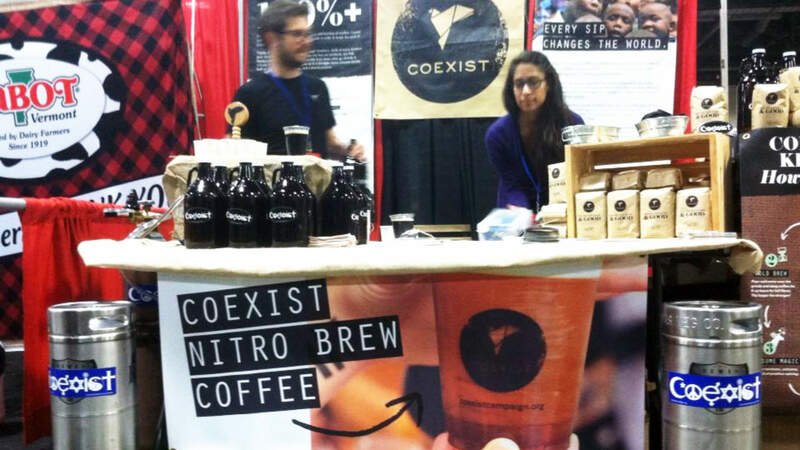 The Coexist team (in shifts) spent the weekend at the Metro Cooking & Entertaining show, giving away samples of our coffee and our Nitro Brew. It was our first two-day US event and the first time that we endeavored to sell Nitro Brew in sizes bigger than a 12 oz. cup. We’d thought about how to send people home with Nitro Brew to share before, but hadn’t really come to a good decision. We discussed gigantic Styrofoam soup carryout cups. Huge, disposable cardboard coffee containers. Milk jugs. And then, as usual, we started thinking about beer. Beer comes in several forms: can, keg, bottle. And growler. What’s a growler, you say? It’s a 64 oz. glass (usually – sometimes they’re ceramic) container used to transport beer, usually from a brewery as a sort of take-home craft beer device. They can be filled right from the tap of a keg on an as-needed basis. In short, growlers are perfect for sending you home from an event with some Nitro Brew. So we grabbed a bunch of growlers, our kegs and sixtels (a sixtel is one sixth of a keg), prepared at Beltway Brewing Company (more on those guys later) and headed to the Walter E. Washington Convention Center. The rest of the story is a blur of setting up, brewing Chemex after Chemex of hot coffee, chatting with people about the Nitro Brew, watching people light up when they discovered our Caffeination Without Representation t-shirts, grabbing as much delicious free cheese as the ladies at the Cabot booth next to us would allow, getting accosted on the metro (unrelated, but a real thing that happened), and eventually selling enough coffee, t-shirts, and stickers to fund 416 weeks of school. Not bad for two days’ work. Check out our Storify for more images and notes about the event, including some great photos of our booth and the whole hall.